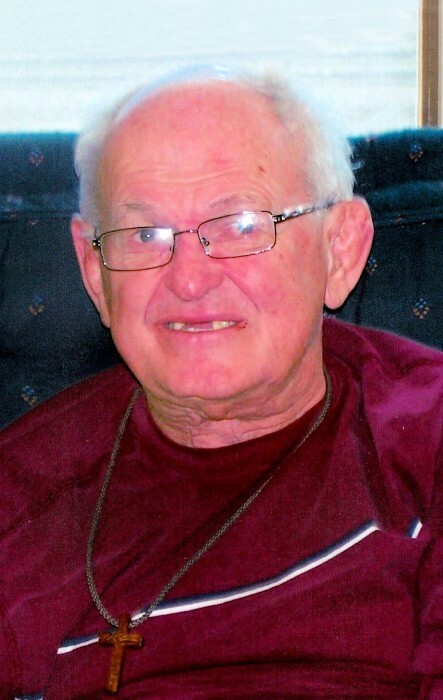 James R. LaPlante, age 84 of Litchfield, MN, died on Monday April 8, 2019 at his home in Litchfield, MN. A Mass of Christian Burial will be held at 11:00 AM on Monday April 15, 2019 at the Church of St. John in Darwin, MN. Visitation will be held one hour prior to the service at church. Interment will be in St. John’s Catholic Cemetery, Darwin, MN. James Rudolf LaPlante, the son of Victor and Rose (Vacek) LaPlante was born on September 27, 1934 in Meeker County, MN. He enjoyed going on car rides and sitting outside watching cars pass by his home. He also enjoyed eating equally as much, maybe more. He liked animals and enjoyed watching programs about animals as well as science fiction shows. Jim was well known for telling people to “behave yourself” and comment on the weather. James is survived by his brothers Harold (Mary Lou) LaPlante of Duluth; Dale (Helen) LaPlante of Litchfield, MN; and sister Mary Jo (Wes) Edwards of Litchfield, MN; and brother-in-law Clarence Amos of St Paul;. He also survived by many nieces, nephews, and grand nieces and nephews. He was preceded in death by his parents and siblings Margaret, Rita, and Austin.